The Consumer Price Index (CPI) fell 0.2% in June vs. a 0.2% increase in the prior month. The 6.8% drop of the gasoline price index accounted for a large part of the decline in the headline number. The food price index moved up 0.2% in June, the smallest increase for the year. The core CPI, which excludes food and energy, rose 0.3% in June, matching the gain posted in May. Prices indexes of new vehicles (+0.2%), used cars and trucks (+ 1.7%), apparel (+1.4%), shelter (+0.2%), and medical care (+0.2%) moved up to raise the overall core CPI. Lower airfares (-3.0%) and recreation costs (-0.1%) were partial offsets. The 1.6% year-to-year increase of the core CPI is approaching the tolerance level of the FOMC with regard to core inflation. A large part of the gradual upward trend has occurred in the first six months of this year. Price indexes of shelter (+1.2% yoy), medical care (+2.9% yoy) and new vehicles (4.0% yoy) account for most of these gains. 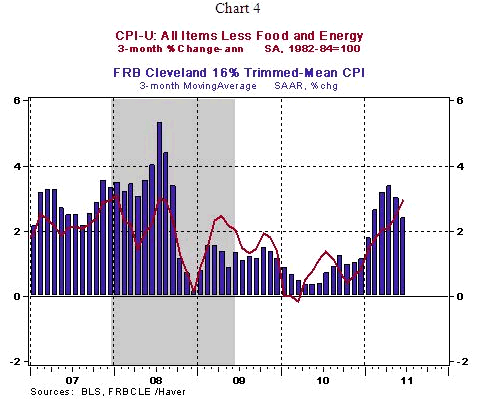 However, the Cleveland Trimmed-Mean CPI shows a small amount of deceleration (see Chart 4). 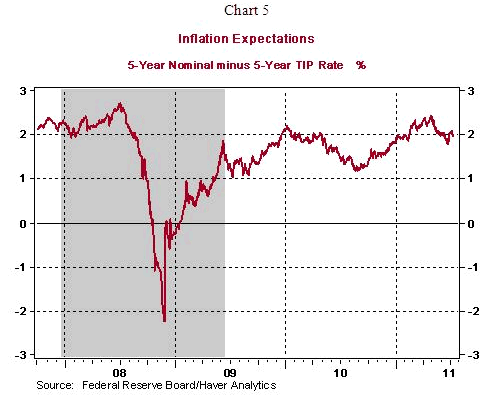 Also, inflation expectations for the medium term are well-behaved (see Chart 5). The elevated unemployment rate and moderate projections for growth in the second-half of the year imply that economic growth is likely to get the upper hand in the inflation-growth debate at the FOMC in the near term. 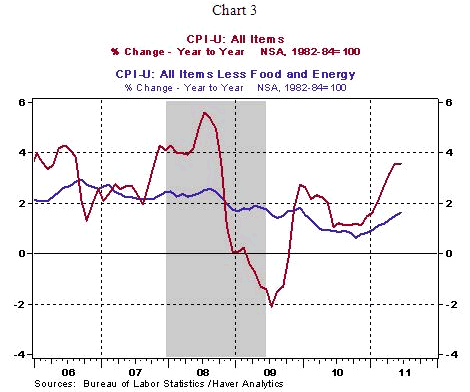 Moreover, if economic growth falters, the upward trend of the core CPI could be reversed. Therefore, it is premature to expect a tightening of monetary policy; the Fed is on hold in 2011.